A fixed place within the mantle or oceanic lithosphere where rocks melt to generate magma. A fixed place within the mantle or oceanic lithosphere where rocks melt to generate magma. This magma rises in columns, causing volcanic activity on the Earth's surface. Because hot spots remain fixed while tectonic plates move over them, they leave trails of volcanoes on the moving plates. The Hawaiian islands formed over a hot spot in this way. This magma rises in columns, causing volcanic activity on the Earth's surface. Because hot spots remain fixed while tectonic plates move over them, they leave trails of volcanoes on the moving plates. 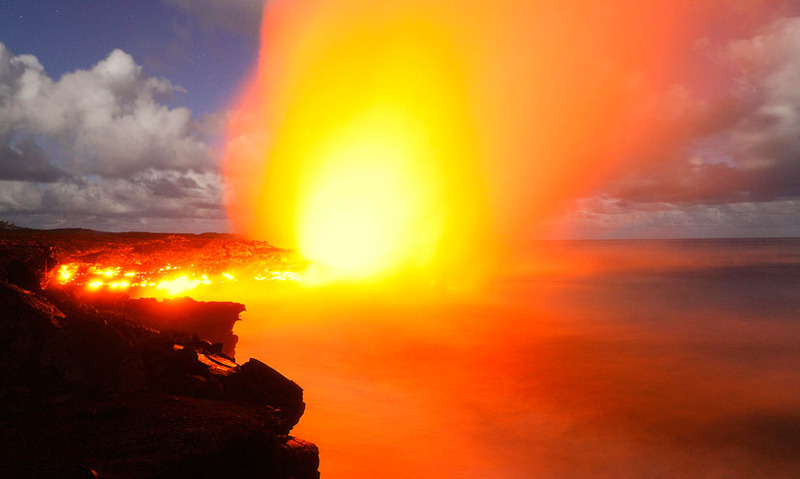 The Hawaiian islands formed over a hot spot in this way.